Christmas morning is a special time in our home where we all gather around the tree to open gifts while remembering all our Christmas pasts. I want to be with my family celebrating not having to prepare breakfast. Which is why I am a big fan of make ahead breakfast casseroles to pop into the oven as I join my family under the tree. 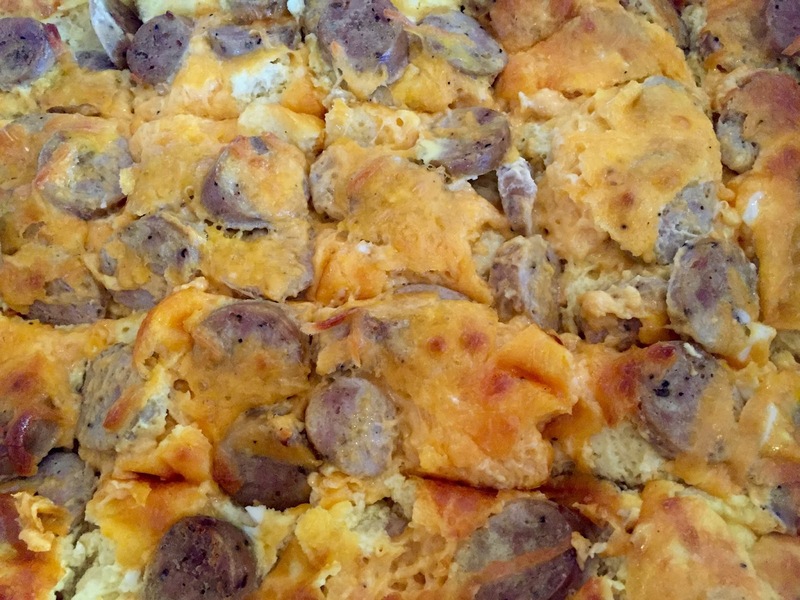 Cheese Grits and Sausage so tasty, easy to make and get ready the night before refrigerating until the next morning. Preheat oven to 350 degrees F. Lightly grease a large baking dish. Bring broth to a boil in a large saucepan, and stir in grits. Reduce heat, cover, and simmer about 5 minutes, until liquid has been absorbed. Mix in 1/2 the butter and 2 cups cheese until melted. In a skillet over medium-high heat, cook the sausage until evenly browned. Drain and slice into 1 inch slices. Mix into the grits. Beat together the eggs and milk in a bowl, then mix into the grits. When I was young I spent many hours at my grandparents home – memories that I’ve cherished. My grandparents, Theresa and Vincent came to American in the great immigration wave at the beginning of the 1900’s from Italy. Along with their dream of a better life in America they brought their love of food and preparing food. My passion for cooking began with these two wonderful people sitting in their kitchen as they prepared feast after feast for our family. Their cooking was so simple with fresh ingredients, many grown in their impressive garden, lovingly prepared to share with our family. As a young girl it appeared to me that my grandmother was always cooking – even before church on Sunday she would start her meal just having to add the finishing touches right before we all descended on their home for Sunday dinner. 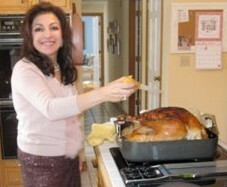 I loved all her cooking although I favored the impromptu meals she would make just for me when I would stop by her home. 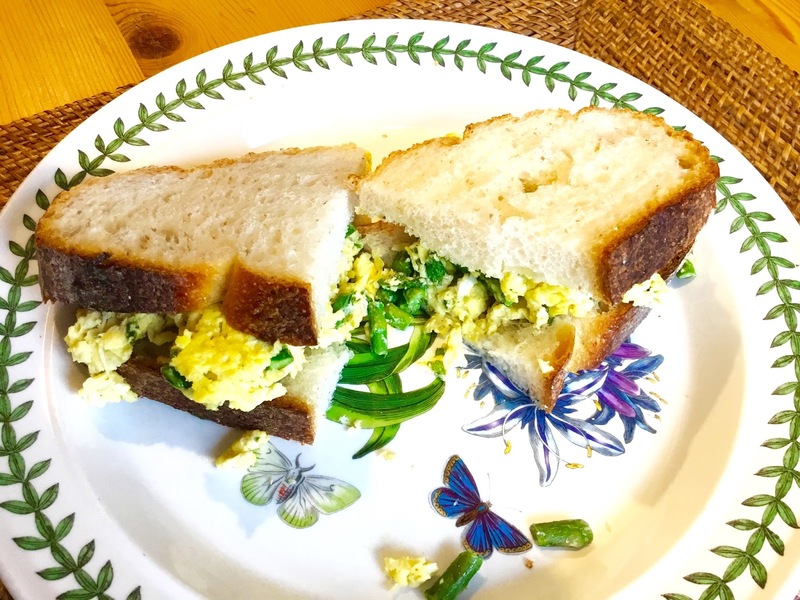 One of my favorites meals was her Asparagus and Egg combination served as a sandwich so good I never tired of eating. My grandmother’s recipes were stored in her memory, not written down, shared through the generations. I was fortunate to have seventeen wonderful years with my grandmother where under her tutelage the foundation for the cook I am today was established. When I was young I wondered as I watched my grandmother add a few simple ingredients together to create delicious food what made her food so outstanding. After much thought I finally discovered the secret ingredient making her food so special – love. My grandmother’s inspiration is still with me all these years late as I prepare food for my family and friends like my grandmother and generations before her I sprinkle a little love on all my food. one bunch of asparagus cut into 1 inch slices. Heat olive oil in sauté pan adding asparagus, salt and pepper cooking until tender about 10 minutes. Don’t brown. In a small bowl combine eggs Parmesan cheese and thyme. 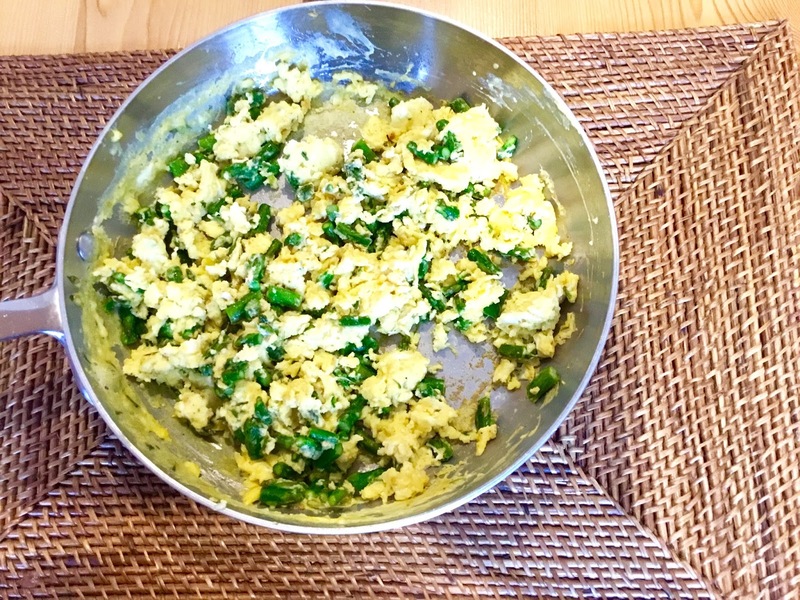 Scramble egg mixture with asparagus cooking until eggs are set and not watery. Brush bread with oil. Toast just to golden. Serve as a sandwich. Makes two sandwiches.